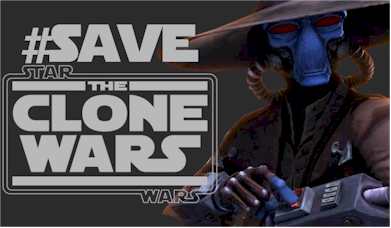 Save The Clone Wars: What Should We Send in to Disney? What Should We Send in to Disney? In the past, fans of Roswell sent in hot sauce, fans of Jericho sent in peanuts, and fans of Reaper sent in socks in successful campaigns to get their beloved shows renewed. 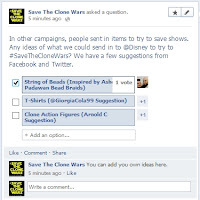 What item(s) should we start sending to Disney to try to get their attention in our attempt to Save The Clone Wars? I had the idea of sending in strings of beads, inspired by Ahsoka's Padawan bead braid. A poll has been posted on our Facebook page, where you can vote for one of the options there or add an idea of your own. In the meantime, you can send your enthusiastic courteous letters to Disney and to LucasFilm to the addresses listed below.